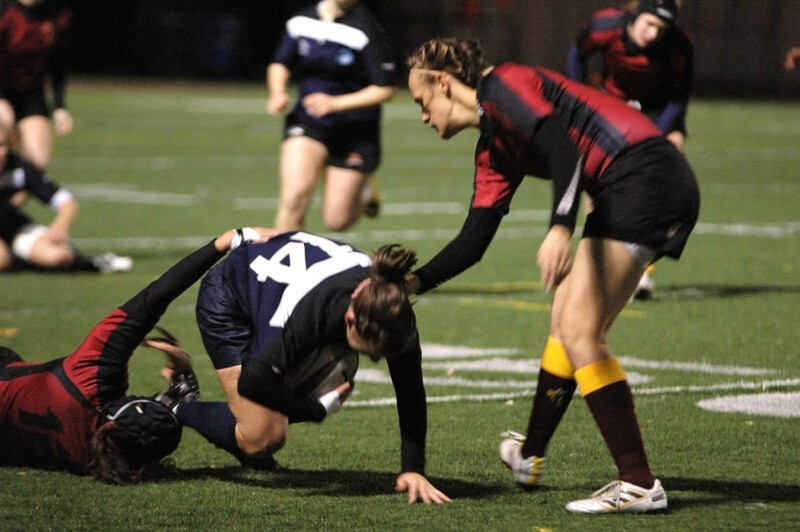 The women’s rugby squad took its second straight QSSF provincial title on Friday night with a 13-8 win over the Laval Rouge et Or. Playing in blistering conditions didn’t help ConU’s cause. The highly vocal contingent of Laval supporters who consistently drowned out the Stinger faithful didn’t help either. The game itself was full of end-to-end action, with both teams vulnerable to big plays. In the first half, the Stingers made some large territory gains on the backs of their forwards. Laval full-back Karen Paquin answered back for Laval, using her speed and size to overwhelm ConU’s defence time and again. It seemed that ConU’s coaching staff did a better job of making half-time adjustments, with the backs looking better organized in the second half and the team finally finding an answer for Paquin’s running ability. “[Paquin] is such a threat with the ball, but we didn’t do anything specifically [in the second half]. [We] just started paying more attention to her,” said McGravie. Still, it was Laval who scored first after some desperate cover tackling by Tittley and the rest of the backs. 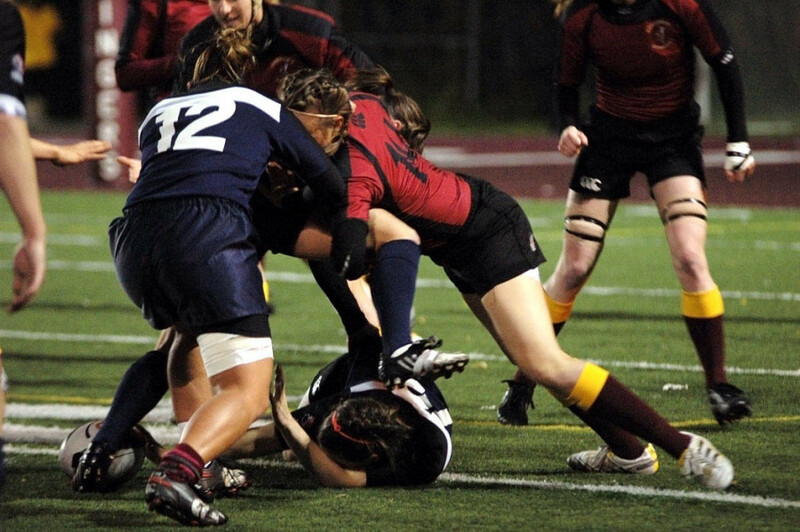 However, the Stingers failed to stop outside-centre Claudiane Renaud from punching in a try over the line. The kick was unconverted and Laval drew first blood to take the lead 5-0. ConU’s forward pack finally caught fire late in the second half and relentlessly drove the ball down the field on a series of mauls from loose play and from line-outs. A group effort resulted in Hughanna Gaw touching down an unconverted try to even the score at 5-5. Each team’s kicker then swapped penalties to keep the score deadlocked at 8 points apiece, with extra-time seeming inevitable. However, ConU managed to pull ahead after some white-knuckle defending by Laval and a series of attempts that were held-up in the try-zone. This time, all-star rookie Cara Stuckey got credit for touching the ball down. Tittley missed the conversion by the smallest of margins to keep the lead to 13-8 with less than two minutes remaining. The Rouge et Or came back down the field and threw everything they had at the Stingers, but desperate defensive work, led by the ever-improving backs, resulted in a second-consecutive provincial championship for ConU. After the game, all thoughts were on the upcoming CIS National Championships. “[The provincial championship] is a stepping-stone. Our goal is to get to nationals,” said Tittley, the league’s MVP. The National tournament runs from Nov. 4-7 at Peterborough’s Trent University. The team to beat will be the University of Lethbridge Pronghorns. The Pronghorns are going for a fourth-straight national championship. ConU will be up against Lethbridge in Pool A, joining Queen’s in trying to unseat the three-time champs. Pool B is the easier draw with the winless Trent Excalibur getting a birth as hosts of the tournament. Trent is joined by Atlantic champions St. Francis Xavier and Ontario’s best, the Guelph Gryphons. This article originally appeared in The Link Volume 31, Issue 12, published November 2, 2010.